The Burrowing Owl is very unusual, compared with other raptors, because it has learned how to live in underground burrows. This gives the Burrowing Owl an advantage in open habitats. Other owls nest and roost above the ground, either in cavities in trees, cactus, or buildings or in nests on top of trees or cactus. By nesting underground the Burrowing Owl can safely live where there is no overhead cover and find food nearby the burrow. Unfortunately, the small mammals (like prairie dogs) have been eliminated and so have the burrows they dug. Without available burrows the population of Burrowing Owls begins to decrease just because there are fewer home sites left. 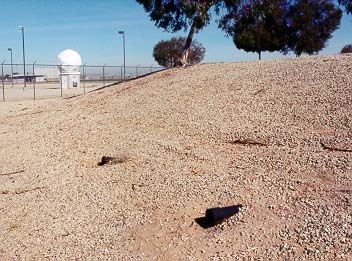 In 1995 Wild At Heart approached Motorola in Chandler about adding artificial burrows near one of their manufacturing facilities. This project was enthusiastically embraced by Motorola. Soon Wild At Heart had installed one burrow and released owls at the site. 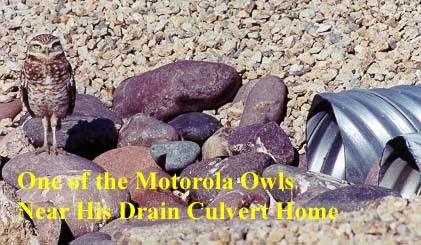 Seeing that the owls liked the Motorola site, Motorola began installing burrows on their own, so that by 2002 there are six burrows in mounds with many of the burrows occupied all year. The two black tubes shown in the photograph are artificial burrow entrances at one of the Motorola mound burrows. The two tubes lead to a central nest box. The benefit of the early Wild At Heart nest box work is that it shows that long term success with artificial nest boxes is possible in industrial areas, provided that a good food supply is nearby. Interestingly, not all the owls choose to live in the nest boxes. Some Burrowing Owls have adopted a small culvert under a sidwalk (see photo above) and some have chosen underground natural burrows dug by gophers. It is important to determine what all the preferences are for burrow site selection so that burrows installed at other sites in the future will have the best chance for success. Wild At Heart is collaborating with Partners in Flight at several different artificial burrow sites to help in determining what preferences, if any, can be discovered by comparing mound and below-ground burrows, number of entrance tubes, and desert habitat types where the burrows are located.